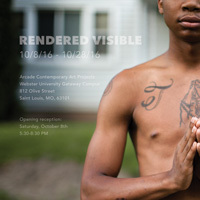 An opening reception for the exhibition Rendered Visible will be held on Saturday, Oct. 8, from 5:30-8:30 p.m. at Arcade Contemporary Art Projects located at Webster University’s Gateway Campus in downtown St. Louis. Click here to view the exhibit opening on Facebook. Rendered Visible is a curated exhibit of works by seven artists addressing the topic of American incarceration and the justice system, and will remain on exhibit in the gallery through Oct. 28. Participating artists include Stanley Jamel Bellamy, Isadora Kosofsky, Zora J. Murff, Paul Rucker, Benjamin Todd Wills and Nikki Zeichner. The exhibition was curated by Amanda Breitbach, lecturer in art at Truman State University. Although the United States has the highest rate of incarceration in the world, holding more than 2.3 million people in federal, state, and local facilities, the day to day life of an incarcerated individual is largely unseen and unknown to the general public. This invisibility is deliberate. Detention centers regulate communication to and from inmates, and most prohibit the making of photographs inside detention facilities, except by official prison photographers in designated neutral settings. Behind this cloak of invisibility, the American prison population has grown 500 percent since the 1970s, continuing to grow despite historically low crime rates. American prisons are overcrowded and expensive, and the criminal justice system is plagued by institutionalized racism, inefficiency, and recidivism. Saturday, Oct. 8 from 5:30-8:30 p.m.